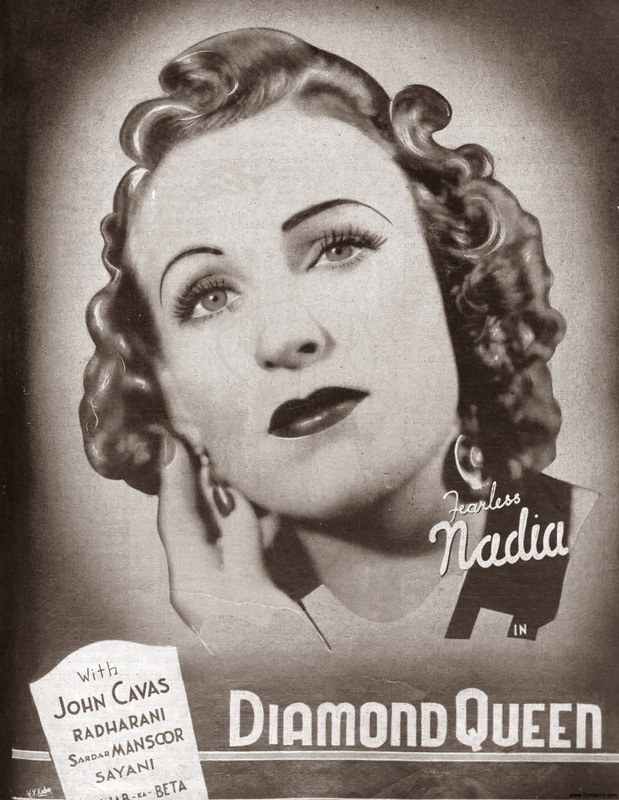 As part of the Southbank Centre's fifth annual Alchemy Festival, Australian composer Ben Walsh and his Orkestra of the Underground are in town touring Fearless Nadia, a screening of vintage Indian action comedy Diamond Queen with a live performance of their new score for the film. The Orkestra consists of 12 musicians playing native instruments, including the tabla, shenai, sarangi and dholak, plus a foley artist and a traditional dancer, whose vibrant, brash, blaring performance lifts a ramshackle old pulp curiosity off the screen to marvellous effect. The show is an inspired tribute to Wadia Movietone's tough gal heroine, a butch Aussie expat who became an unlikely but major star of pre-Bollywood cinema, known for hearty fist fights and performing her own daredevil stunts. Quite unlike anything the American studios dared put forward in the 1930's, Nadia endures as a highly unusual feminist icon ripe for rediscovery in the west. A strapping specimen of Amazonian womanhood marrying the brute force of Mae West with a sore head to the feminine grace of John Wayne, Nadia was born Mary Anne Evans in Perth in 1913. She relocated to Bombay with her parents aged nine, learned to speak Hindi and became an accomplished rider and circus performer, eventually crossing paths with an Armenian fortune-teller who advised her to change her name to something more dynamic. Discovered by influential producer J.B.H. 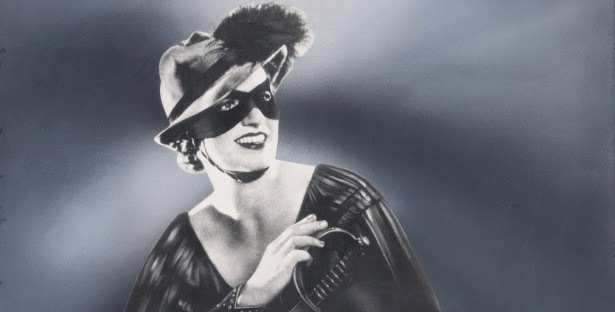 Wadia, the blonde, blue-eyed Nadia graduated quickly from minor bit part roles in his films to dramatic leads, achieving immortality in Hunterwali (1935), in which she wore an iconic domino mask (see below) in the manner of Zorro or the Lone Ranger. Her presence on posters promised "Whips, quips and swinging hips" and who could ask for more than that? Diamond Queen is set in "the quiet jungle near Sundarnagar" and plays very much like a Hollywood Western, its revenge plot revolving around the ownership rights to lucrative natural resources and familial betrayal. Director Homi Wadia, J.B.H. 's younger brother, packs in a moustachioed villain chuckling and arching an amused eyebrow at his own dastardliness (Sayani Atish), a highway bandit (John Cawas) and spontaneous brawls with chairs cracked over noggins and big men cast out on their ears. There's even a trusty horse with a name, the Son of Punjab. In amongst all the punch-ups atop perilous waterfalls and moving cars, there's also room for such comedic old standards as the time-honoured jalopy-breaking-down-on-the-railway-tracks and a buffoonish trio resembling the Three Stooges to serve as a chorus. As Madhurika, Nadia herself is primarily required to thump bad guys, toss furniture and leap from vehicles, but she also displays a great deal of charm in her romantic scenes with Cawas as handsome outlaw Diler. Their betrothal at the end was met with a rousing cheer from the punters in the Queen Elizabeth Hall, I'm pleased to report. The version of Diamond Queen we saw last night was abridged from three hours to a running time deemed more manageable for the "YouTube-attention span generation". This cavalier cutting might have risked alienating diehard purists with a better known or more serious work, as might the virtuosi Orkestra's occasional showboating antics. However, I for one felt their efforts to bring Nadia back to life were superb and doubt I'll ever forget the sight of violist Shenzo Gregorio going about his business while suspended upside-down from a harness above the stage. Magnificent stuff. Wow! Is Nadia on DVD? This sounds great! I'm not sure GOM, but I rather fear not. There are a few brief clips floating around on YouTube that convey the general idea, which is something at least. Hopefully Ben Walsh's project will reignite interest as Nadia really is something else. I must confess I'd never heard of her before but am now more than keen to see more. Haha! I know how you feel Erik. Have yet to find a DVD of the lady in action but, 'Fearless Nadia: The True Story of Bollywood's Original Stunt Queen', a biography by Dorothee Wenner (Penguin Books India, 2005) is available on Amazon for those interested in finding out more.